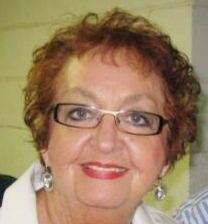 Judy L. Stice- Krouse, 75, of Noblesville, passed away on Wednesday, April 10, 2019 at Riverview Health in Noblesville. She was born on April 7, 1944 to Clarence and Louella (Alexander) Edge in Noblesville, Indiana. Judy worked in school resource development for Moore Public Schools. She loved her family. Judy enjoyed sports and was an avid Oklahoma State fan. She is survived by her mother, Louella Sampson; her sons, Greg (Lisa) Stice and Chris (Heather) Stice; and six grandchildren. In addition to her father, she was preceded in death by her husband, Ross "Tex" Stice. Services will be held at 12:00 pm on Tuesday, April 16, 2019 at Randall & Roberts Funeral Home, 1150 Logan Street in Noblesville, with Greg Stice officiating. Visitation will be from 10:00 am to the time of service at the funeral home. A private family burial will be held at a later date. Memorial contributions may be made to Friends of Hamilton County Parks, 13295 Illinois St, Suite 138, Carmel, IN 46032 or (317)750-6198 or www.friendsofhamiltoncountyparks.org .